Is it Feathers or is it Plume Panels? When someone starts collecting carnival glass vases sometimes it is very difficult to identify the pattern; they all seem to look alike. We will try and help explain the difference between Northwood’s Feathers and Fenton’s Plume Panels. The feathers on the Northwood Feathers vases are more flat and not raised like Fenton Plume Panels. The feather design on the Feathers vase starts at the top flame and tapers as it goes to the base but does not go all the way to the base, and the feathers are very v-shaped. The plume panels design on the Plume Panels vase do not start at the top of the flame, but do go down closer to the base and stay the same size all the way down. 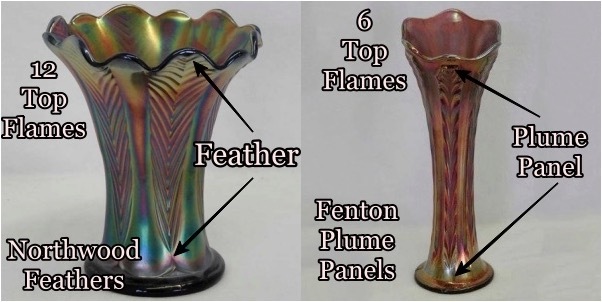 Another difference is that Fenton Plume Panels has 6 top flames and Northwood Feathers has 12 top flames.